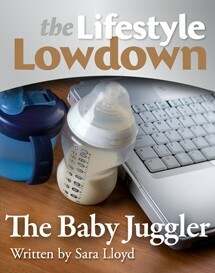 Based on the popular blog “The Babyjuggler: Three kids, Two jobs, One life"; winner of the December 2008 “Best of the British Mummy Blogger Carnival”, this book gives you the lowdown on how to survive the return to the world of work after the birth of your first baby. Everyone knows women can “have it all” these days but this guide shows you how to avoid the “doing it all” syndrome which leaves so many working mothers totally exhausted and stressed. Sara Lloyd has two jobs. One as a Director in a medium sized publishing house, where she spends her time trying to imagine what a book might look like in a fully digitised world and then persuading people to embrace the necessary change to ensure reading and writing continue to be appreciated for a long time to come. Her other job, which might be called her ‘life’s work’, is as Mother to three children, Eden (8), Nathan (4) and Ava (3), (and occasionally, when she has a bit of spare time, as wife to husband Paul). Sara has been awarded 'Digital Leader of the Year' at #futurebook16!